Two Bears Farm and the Three Cubs: Using ProFoot for Running and 3 Prize Packs Giveaway! Using ProFoot for Running and 3 Prize Packs Giveaway! 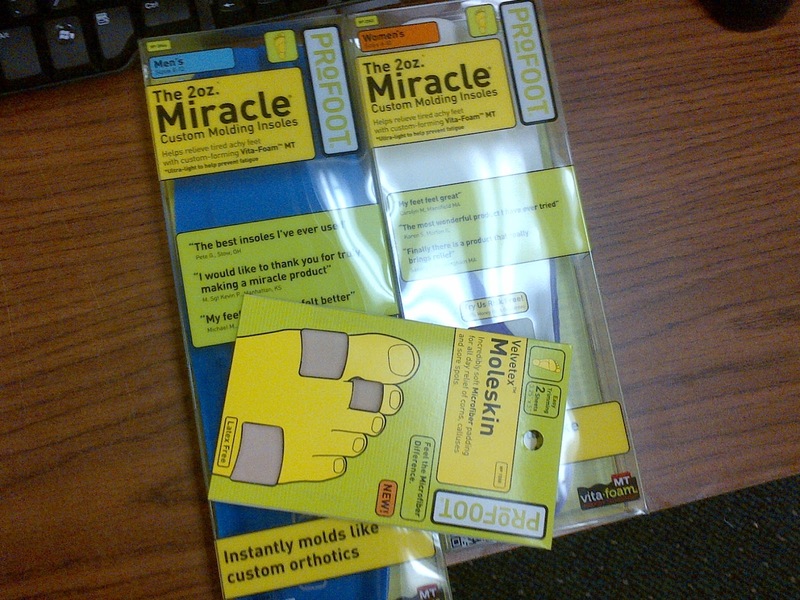 I don't typically use any inserts in my shoes - running or otherwise - but recently ProFoot contacted me to see if I'd be interested in reviewing their products and hosting a giveaway. To be honest, I once had a negative experience with an insert (different brand), but that was years ago. I have been troubled by an area on the ball of my right foot, and I thought trying the ProFoot products made sense at this time. In fact, maybe it was just the thing I needed to ease the pain. In the first package they included 3 items for me, plus one for my husband. But when they found out Paul is plagued by foot problems (indeed, I recently got him started soaking his feet in Epsom salts, although initially he scoffed at me over it) including plantar fasciitis, they sent Paul his own separate package! Paul was very excited to put all his new "gear" to test. He's an accountant, did you know? Which means an analytical mind. So when I asked him to get me his thoughts on these products, first off he wanted an extension to try them longer. I explained that typically companies like a 2 week turnaround on a review. So he pulled it together (after all, nothing like a good deadline to get your accountant in action) and sent me a 3 page document review. Single typed. Hopefully he'll forgive me for my extensive condensing! Okay, so my stuff first. I used the lines on the shoe inserts to cut them to size. This worked great for me. 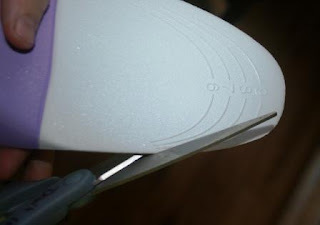 Paul said some of his didn't seem quite on size, so he preferred to take his old inserts out of the shoe and use those as a guide for cutting. I've been wearing the 2 oz. Miracle Custom Molding Insoles in my running shoes for almost 2 weeks. I raced a 5K in them. I ran a semi-long run (9 miles) mostly at tempo in them. I ran on grass, trails, gravel, the treadmill, and pavement (I think I covered everything but the beach). I can say that I really like them! They mold to your feet like custom orthotics using a Vita-Foam technology. They feel comfy, firm, and light. 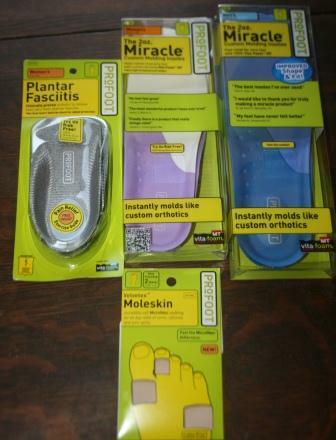 I am extremely prone to blisters (I once had custom orthotics made which gave me such severe blisters I could never wear them) and I did not have so much as a rubbed spot anywhere! My feet don't slide around in them - they hold firmly in place. I have not tried the PF inserts, as I don't currently have any Plantar Fasciitis issues (but I have in the past, so I will hold on to them to put to good use as needed). The moleskin is great. We've used moleskin a lot when hiking for sore spots, and it's a must have for hikers. This moleskin is the softest I have ever felt - which in reading the package is because it is made from Velvetex, a breathable material softer and more durable than ordinary moleskin. Sometimes I do get hot spots on very long runs, so this will come in handy! First impression was amazing! Any skepticism whether I’ll like these inserts has vanished. The soft foam was very noticeable both on the heel and in the forefoot section. I liked the feel of the softness in the forefoot surprisingly because it gave me confidence to pick up the pace and run with good form...at least for the first two miles. Then my lack of fitness started to catch up to me and I slowed for the last two miles of my four mile run. The foam under my heal also felt almost massaging and not once did I feel any pain from that area. That was very surprising to me because lately I can do no exercise and wake up the next morning with huge heel pain. I blame this mainly on overuse by chasing three little kids and walking on hardwood floors at home without any support. Another interesting thing I noticed about the inserts is they remembered every shape to the point of even taking on my sock thread pattern and flakes of little rocks that worked their way into my shoe. After the run the heel padding was barely noticeable. Paul also loved the Triad Orthotic, which he put in his work shoes: These orthotics are very comfortable and as soon as I put my shoes on in the morning the pain simply goes away. 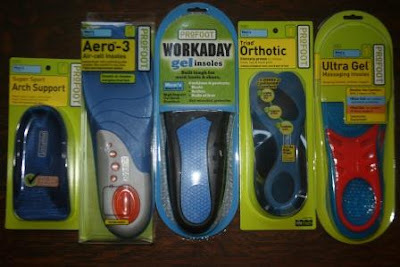 I love these orthotics! The box says they cradle the balls-of-feet and prevents that burning sensation, comfort and supports arches, cushions heel from impact. I couldn’t agree more with their claims. 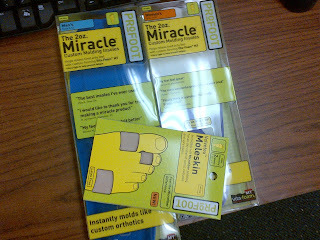 While he did love these orthotics, he did mention that he wished they were full sized, instead of partial. In general, while he liked all the products he tried, he had a preference for those that fit the full shoe. Paul was thrilled to get to review something for the blog and is enjoying the much needed extra cushioning on his feet. So, readers, would you like a chance to try out some amazing products from ProFoot? They are generously giving away prize packs to 3 readers! You'll receive a men's and a women's 2 oz. Miracle Custom Molding Insole (which was the favorite of both Paul and I) plus some moleskin which is perfect for offering relief to corns, calluses, and sore spots. To enter, just click on the "Read More" beneath my signature. Also, be sure to check them out on Facebook! Disclaimer: My husband and I received an assortment of these products to try. The opinions expressed above are our own. Also, writing from personal experience, know that using an insert in a shoe for the first time can slightly alter your gait, so you'll want to start slow until you adjust! These look great. It will be interesting to see if these help issues further up your legs, even knees, hips, back, and glute. Alignment starts from the ground up. So glad they worked for both of you! hey lisa, i got the tshirts at WALMART probably 3 years ago! i bet you could check walmart online and if they don't have any google them. if i see any i'll let you know for sure! These sounds great! I love that Paul tested them out too. Oh I understand the plantar fasciitis pain I was plagued with it for about a year. I hike most every day and have never used insoles I make sure I wear proper fitting hikers it would be nice to try them. I've recently fractured my foot in a half marathon which from what the doc says will never be the same. He advised me to have surgery, shots or where an Orthotic. I opted not to do the surgery or shots but I've heard great things about these. Hope these help your husband. It is NO fun when you love to run but have so much pain in your feet. These look worthy of a try Lisa--thanks. When I ran more, I always had trouble with bruised heels; I will definitely be looking for help when I start pounding pavement again. very cool that you both got to try them - and liked the products. Lisa, thanks for the review! I'd love to try these and see if they help with knee pain as well. Oh darlin' there are days my itty~bitty feet (they haven't grown since the fifth grade) need a miracle!!! Heehehehe! I don't own a 'reader' either...I used the Adobe Reader on my computer to read the book so ya can still win a copy if you desire. 'Just sayin'! Enjoy your day sweetie and have fun with the giveaway!!! Their insoles worked really great for me. I have my giveaway going up next Friday with the next review. I'm glad they worked for both of you! I'd be interested in trying some of their arch support inserts, as I've been dealing with plantar fasciitis for some time! I'll bet some inserts would help my feet, as I have to walk a lot of hills on campus. Have a wonderful day, Lisa! Well, again not sure if I really entered or not, I always have a fit with these things. They sound really cool, I could use them. Did I ever tell you I am the poster child for Plantar Fascitis? Mine was so bad they said I would end up in a wheelchair, despite surgery, which I did not have...only minor. I went to at least three doctors and podiatrists before found the answer. Maybe these would help my knees and hips too . . . These are on the list of things we have to regularly send are son when he is in afghanistan! Ooh, I just got a pair of inserts and LOVE THEM. Glad you decided to give them a try. I love shoe and boot inserts; these sound wonderful! I've been having problems with bunions and am wondering if I should give up flip-flops. Silly, yes, but when the pain keeps me awake at night, flip flops are easy to give up! I like the Callus Blaster. No more scrapping to get rid of calluses with this. I like that they offer toenail nippers for cutting difficult toenails. My PF drives me insane! It's complicated by neurological damage and some days I want to give up walking! LOL I LOVE these inserts and I'd like to try the Ultra Gel ones for the heel support. Thanks for the chance to win. I like their virtual custom fit feature. Wow! What a great review! I also suffer from plantar fasciitis, and have tried inserts in the past that end up making my knees and hips hurt. But, to hear that when he would step into his shoes the pain would go away, that is encouraging. Thanks for the opportunity! That those crazy gel toe things actually are for pain relief. I'm starting to think I should look into them! I would LOVE to try those! Just signed up for my second half marathon. I like that the Triad inserts are not full-size (I know, I'm disagreeing with your husband, lol). I have found that the full-size ones I use make my shoes uncomfortably tight, like a need a larger shoe size with them in. I'm prone to plantar fasciitis so these insoles look great to keep my feet happy when I run! The Heel Rescue Cream is calling my name! I have such a hard time with my heels during the summer and I love to wear sandals. This would be great to have! I have just been diagnosed w/ degenerative knee something or other. Hoping that these may help w/ that. I would love to try the calluses removers! And my husband has had multiple surgeries on one of his feet so hopefully they will help him! The Pump Pouches look handy! I like that the Smart Arch orthotic automatically adjusts to support high or low arches. The biggest problem with orthotics is they don't accommodate everyone. Has anyone who's tried these tried superfeet? I've had Achilles problems and have the makings of plantar fascitis... and I currently love superfeet, but am always open to new/better options.